It's here: the perfect solution for those of us who love small, furry animals (and who doesn't? ), but have to deal with dorm no-pet policies. The savior is PF. 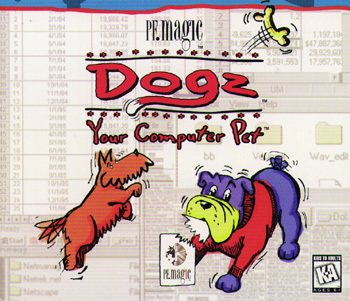 Magic's Dogz, a CD-ROM that provides "all the joys of owning a dog without the need for a pooper scooper." Dogz is, essentially, a dog on a disc. The program begins with a "pup quiz," which determines what type of owner you are, and suggests what breed of dog might be a good match for you. Next, you go to the adoption area, where you can play with any and all of a group of different types of canines. (This part of the program can be previewed at the Dogz Web site at http://www.dogz.com) When you finally make the big step and decide to adopt one, you are asked to name your pooch, and then, within an alarmingly short time, become an official member of a quickly-growing demographic group: those who talk to their computers. True, it may not reflect very well on your social life if you regularly hurry home to lovingly stroke your mouse and beam proudly at your monitor, but Dogz may lead you to do just that. No support group has been announced as of yet. The cyber-pooches come in a variety of breeds, and if you don't like the color of yours, well, just get out the old paintbrush and give Rover a touch up -- it takes only the click of a mouse. You can feed the dog, play fetch, and even teach the dog tricks -- he'll respond to your petting and feeding with excitement, and eager (sometimes a little too eager) panting. You can even take a digital snapshot of your dog, so that you can remember those special moments, and keep track of his growth. And for the sadist in all of us, there's a mist bottle, to spray in the doggie's eyes when he's being naughty. All of this action can take place either in a special "playpen," or right on your regular desktop screen -- it's always fun to watch your History paper get trampled on by ol' Spikey. When you're away from your desk, you can activate "guard dogz," the screen saver included with the CD. Retailing for about $20 (available for Windows and Mac), Dogz is a cute program, and it may even fill that deep psychological void that likely exists in your life if you've actually made it this far into the review. With all of the fun of owning a dog and none of the drawbacks, Dogz is a computer geek's best friend.